Islington Hall in Tilney All Saints, near King’s Lynn, Norfolk sleeps 11 people. 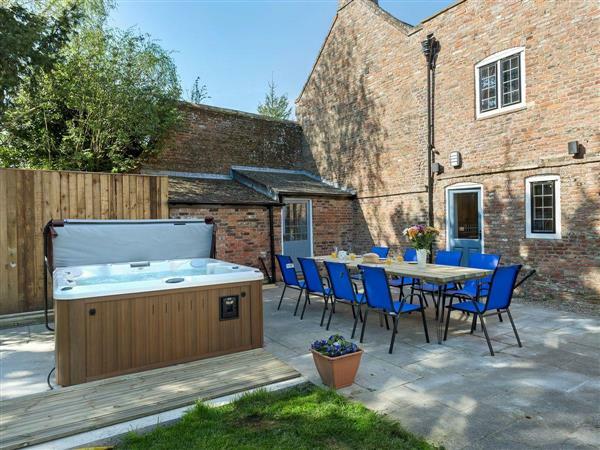 Islington Hall near King’s Lynn is a superb wing of Grade II listed Islington Hall, which is adjacent to the owner’s home, and has a large garden and a private hot tub to sit back and relax in after a day spent exploring the area. There is plenty for all the family to see and do, from Her Majesty’s country retreat at Sandringham, 20 minutes by car, and the sandy beaches of Heacham and Hunstanton to the medieval town of King’s Lynn, which is just a short drive away. Hunstanton is a traditional seaside resort and offers good days out for all the family, as does Heacham, which has been a seaside resort for over 150 years. For children there is Church Farm, 10 miles south of King’s Lynn, where you can meet the animals and enjoy refreshment in the farm café/restaurant. Snettisham is great for spotting the birdlife that inhabits this stretch of the Norfolk coastline and you can often see thousands of wading birds in the spring, or sit and watch the birds on the lagoon islands. The beach is 17 miles from Islington Hall near King’s Lynn. Nearby there is horse-riding, golf, fishing and roller skating. The shop, pub and restaurant are all 3 miles from Islington Hall. Living room: With wood burner, 42 Sky TV (Sport and Movie package) and DVD player. Oil central heating, electricity, bed linen, towels, Wi-Fi and fuel for wood burner included. Travel cot, highchair and stairgate available on request. Welcome pack. Enclosed lawned garden with patio and garden furniture. Enclosed paddock. Hot tub for 7 (private). Private parking for 6 cars. No smoking. Please note: There is an unfenced pond in the garden. Holidays at Islington Hall run from Friday to Friday. Pets allowed at Islington Hall. For a better idea of where Islington Hall is, you can see Islington Hall on the map below. Islington Hall is in Norfolk; should you be on the lookout for a special offer, you can find all the special offers in Norfolk. It's always worth checking to see what is on offer at the moment. Do you want to holiday near Islington Hall (UKC3277), you can see other cottages within 25 miles of Islington Hall; have a look to find your perfect holiday location.